Brief – To produce a series of development projects that placed the BBC Academy at the forefront of digital innovation ahead of its move to Birmingham. To work with Chromatrope devising, developing and implementing these projects. iTunes U was the first of these. Developed good working relationship with Apple. Created intial launch collection and post launch content schedule. Wrote design brief for the Academy iTunesU site. The BBC is constantly trying to do more with less. 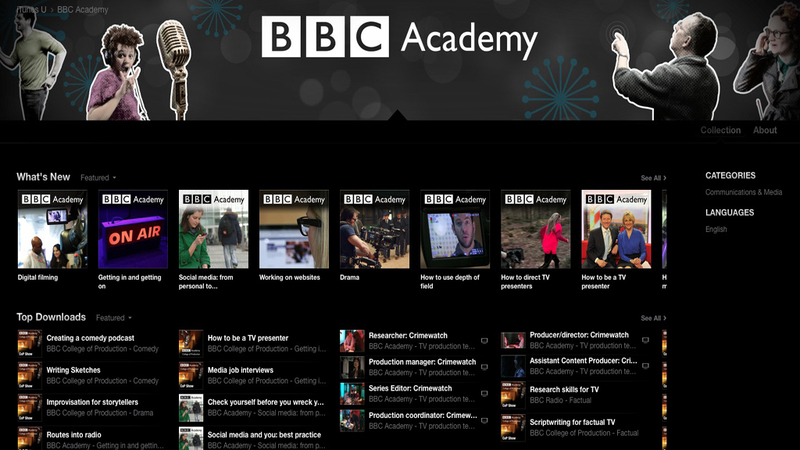 This was one of the BBC Academy development projects – along with the Future Learn MOOC and Choose your own BBC Career – that took existing BBC Academy content, repackaged it and placed it on different global platforms. This maximised the value extracted from the licence fee and attracted new audiences who might not otherwise have been aware of the BBC Academy. We knew the design would be extremely important in enticing people to the site. The most popular brands on iTunes U were those that had really thought about their online presence and considered carefully which images would work best for each collection – for example, TED, the National Theatre and The Open University. Our design brief pointed to these sites as good examples. It also had to be GEL compliant as far as possible while working within the confines of the Apple iTunes site. The BBC has been on the main iTunes site for many years so we could also look at BBC programmes and see what worked well. The site went live in January 2015 and is regularly updated with fresh content to keep people coming back. The initial statistics are very promising. The vast majority of our traffic was in China and the USA – so this project brought a new global audiences to the BBC Academy as soon as it went live.